I'm done with Borobudur and get the driver to take me to backpacker haven of Jalan Sosrowijayan, close to Yogjakarta Train Station. It doesn't take long to find a hostel and not much longer for a tout at the hostel spotting fresh meat. He talks to me (warning number 1) and says that there's a batik artist exhibition (warning number 2), and today was the last day (warning number 3). Luckily I've already read up on Yogjakarta and know about the art exhibition scam where overpriced batik are sold to unsuspecting tourists. I'm not sure why I agreed to follow the guy to the so called exhibition, but most probably because I thought I could have some fun with the touts. At the exhibition, the batik were for sale at £30 and nothing that I hadn't already seen before in plenty of Indonesian shops being sold for around Rp70k or less than 50 pence. While discussing prices with the "artist", he mentioned that he was willing to compromise on the price. I politely told the guy I didn't want to insult him by negotiating. I showed him a knowing smirk and he showed me the door. With the obligatory tout out of the way, I have a look around the city. The major road in Yogjakarta is Malioboro, a 2 minute walk from my place. There's a big shopping mall on it called Malioboro Mall. It has everything except proper vegetarian food, like everwhere else in Indonesia or at least Java. So I settle for some bread again. Everywhere on Java so far, Indonesians go crazy for breaded goods. Bakeries chains, Dunk'in Donuts, JCO Donuts, you name it, the Indonesian love it (Talkie Toaster heaven). So back to the palace, it's supposed to be the number one attraction in Yogjakarta city itself, but I wasn't that impressed. In fact I couldn't even be bothered after 20 minutes and head back to my hotel. Things have started to go a little bit wrong now and I'm feeling the onset of nausea. Being cooked on a searing hot day wasn't helping very much and the longer I walked, the more nauseous I felt. I'm about 500m from my hotel, but I can't go on and make my way into a large pharmacy, sat down and asked for some antiemetics. Then promptly slumped head first onto the counter until someone brought me a glass of water. Eventually I get the pills, but still have to lie down on a row of seats. It was an hour before I felt well enough to leave the pharmacy. The pharmacist seem to think it was was dehydration. Maybe it was the 3 days of very little sleep. Later that evening as I'm suffering from stomach cramps, I realised I'd also let down my guard when it came to food by eating some raw vegetables with last night's dinner instead of just shoving it aside like I usually do. Possibly it's a combination of all of these. But I go to sleep early anyway in readiness for another early start tomorrow to visit the temple of Prambanan. Yogjakarta has a bus system simila to Jakarta's TranJakarta called TransYogja. Again I get up at 0600 for Prambanan in another attempt to beat the crowd. Very simple to go there, get a bus from one of the many designated bus stops on Malioborom, take number 1 bus and Prambanan is the end of the line. Then it's a 400m walk to the temple entrance. Plenty of transport like rickshaws and tuk-tuks there, waiting to over-charge the tourists for though who don't know the way or don't want to walk. The whole complex has been significantly damaged by the 2006 Yogjakarta earthquake. Candi Prambanan seems to have been mostly restored as you can see. 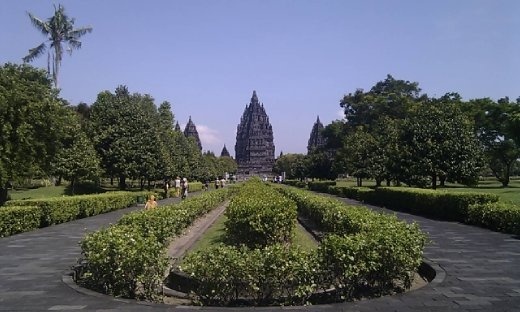 I think in many ways, Prambanan does suffer from the ugly sister syndrome when compared to Borobudur. It doesn't help that the temples have suffered so much damage and so much restoration still needs to be done. I've been at the temple for close to 4 hours now and I'm starting to feel sick again. Then on the bus back to Malioboro, I compound my problems by choosing to sit facing the back when I had a complete choice of seats, making the motion sickness even worse. Tee ordeal is over after an hour and I head back to my hotel and only emerge for dinner. I've only been in Indonesia 11 days and I've booked my flight ticket out. The heat and probable food poisoning is making me so sick I just need get out of the country and find some place cooler where I can lie down for a few days. In the end, the grand tour of Java has turned into a bit of a damp squib. I didn't know much about Indonesia beforehand. All I knew was the the island of Bali and the seemingly endless news of bombings and religious bigots. It turns out the average Indonesian is very tolerant. There's none of that rubbish about men/women greeting etiquette I kept reading about. Sure, there's plenty of girls dressed in religious headscarf. That didn't stop them from asking me if I'm Japanese, and they giggle just like any teenage girl when I blow them a kiss goodbye. Even (Islamic) bearded men sometimes have a chat with me when they realise I'm not a local.